Long afloat on shipless oceans, I did all my best to smile, 'Til your singing eyes and fingers, Drew me loving to your isle. A reimagining of familiar motifs and shapes. A traditional shell cameo, a silver ID bracelet, a scallop shell pendant. All of our horn jewelry is hand carved by artisans in very limited quantities. Horn is a perfect material for jewelry because it is extremely light in weight, so it is easy to wear in larger sized pieces and as earrings. The natural color of the horn mixes beautifully with other jewelry in gold or silver. 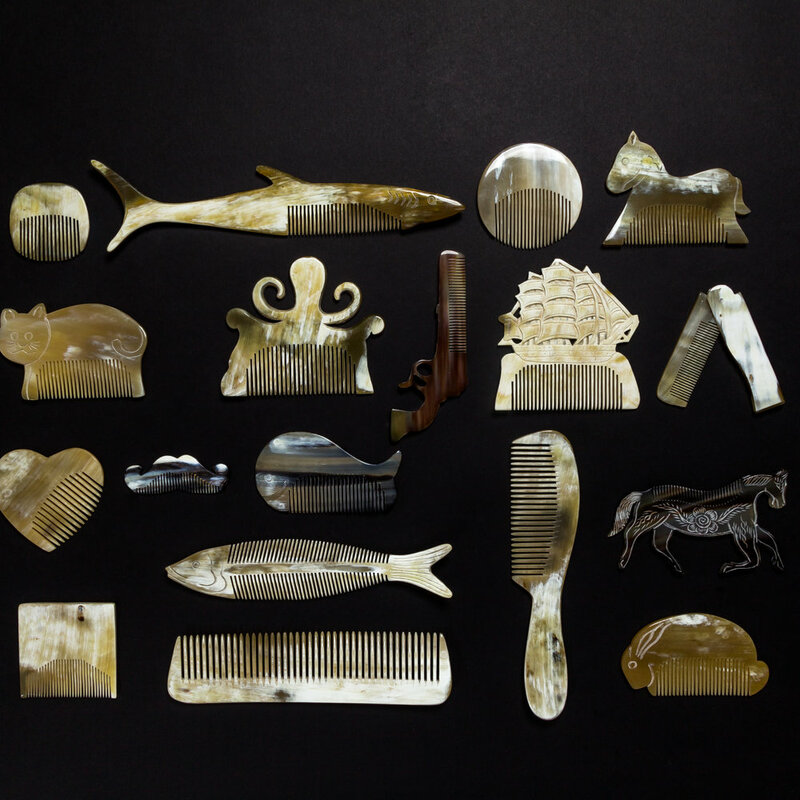 Horn is a naturally beneficial material to use for hair combs. Horn combs are rich in amino acids and keratin. Using a horn comb helps to keep the keratin in balance on your hair. Using a horn comb will leave your hair silky and shiny. We have taken the familiar and rendered it in the unfamiliar. Traditional silver souvenir spoons are reimagined in horn, perfect for sugar or salt. The gentleman’s dresser: change dish, shoehorn, and moustache comb take on a new patina. Seashells become works of art, mini sculptures in horn. 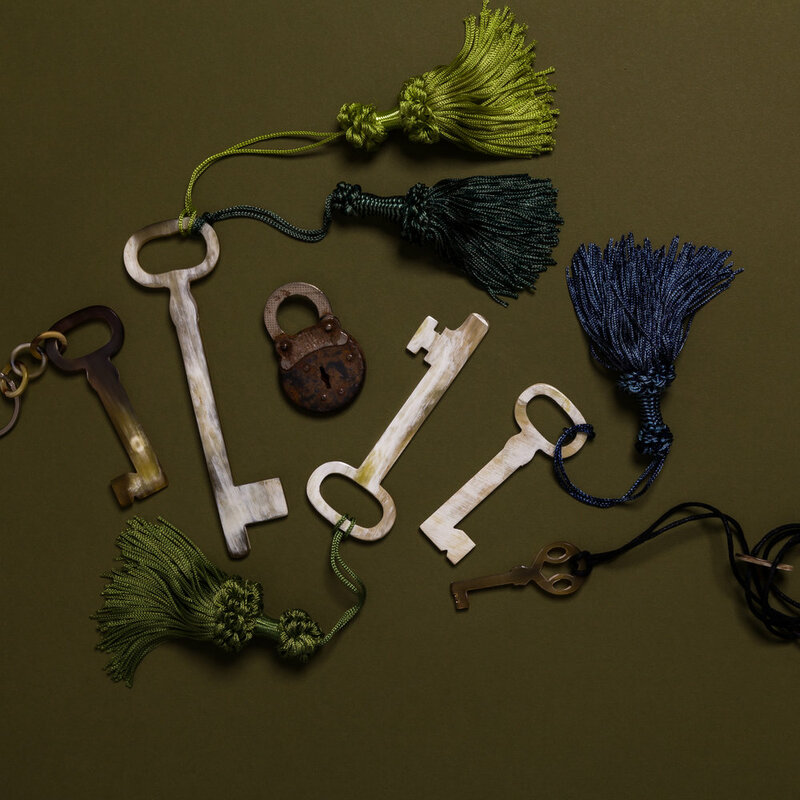 The traditional lucky horseshoe or a skeleton key becomes an esoteric objet of desire. The humblest of items like plastic swizzle sticks become objets of luxury when recreated in hand carved horn. These pouches are made from the recycled skirts of the Hmong people. The fabric is richly and densely embroidered by hand, when the clothing is no longer needed or useful, the fabric is sold to be recycled into new items. Each bag will be unique in terms of the patterning, please choose by color palette-bright or subdued. Hand Carved alabaster dishes serve as the perfect vessels for soap, jewelry, or other trinkets. Pure white in color, they work as a wonderful accent in the bath.